I only became a Christian a short time ago but I have begun to see how God has been present during my long and complex journey to faith. I was chatting to a friend about our old school days and I remembered an incident from 30 years ago. I realised that was the time I first encountered grace and forgiveness in a big way. I left the house at the right time but I would go walking along the beaches, through our local forests for miles and miles. I didn’t get up to any mischief I just didn’t want to go to school. Inevitably I got caught and my mum grounded me, stopped pocket money, got cross at me and so on. All the usual things you would expect. There were tears, tantrums as I was a fairly volatile teenager actually I was a bit of a brat if I’m honest. But before I go on let me tell you about my mum. I know most people think their mum is awesome but I think I really got lucky. My mum is the most selfless person I have ever known. She never, and I mean never ever, thinks about herself. 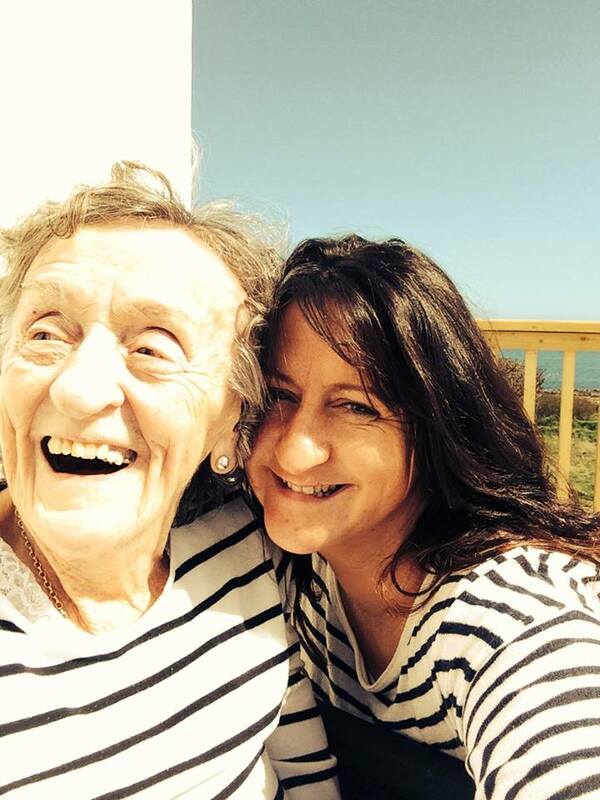 She is enduringly positive and happy and still at 87 years old with dementia is quite simply an utter joy to everyone around her. Everyone loves my mum. She is truly special. If I turn out to be a fraction of the person my mum is I’ll have done myself proud! So anyway. … I went back to school, tried my best to get on with it but to no avail. I started playing truant again. This time I was away from school so much some of my teachers didn’t even remember I was in their class. Eventually I was caught ….again. I came home one day and walked into the house. My mum was hoovering the hall. (my memory of this day is so vivid) She looked at me and simply said that the school had called. I knew immediately what they had called for. I was about to start in with excuses when mum put her face in her hands and burst into tears. It was the first time I had seen her cry. Our family had problems, big problems which I’ll not go into, and now as an adult I realise my mum was under an extraordinary amount of stress, and that I was the straw that broke the camel’s back. I felt something inside me crack. She then asked me why? Why did I hate school so much? Why was I so unhappy? She said she couldn’t bear seeing me so unhappy and why hadn’t I told her? It broke her heart and that broke mine too. She wasn’t angry she was just sad. My overwhelming memory of this day was that I’d have done anything, oh my goodness anything to have undone what I had done to her. To have brought my sorrows to her, talked them through. To have been a good daughter and gone to school, studied hard and made her proud. Oh what a regret. But we had a long chat then and got through a lot of stuff and I knew more than ever that I was so loved by this wonderful human that nothing I could’ve done would change that. I felt better, more at peace and calmer than I had in months. Nothing had changed, I still hated school and I still didn’t want to go. Though now I knew my mum loved me, that I was forgiven. And as a result of that I promised I would never let her down again. I don’t think I have. I’m pretty sure if she had been angry it would never have had the same effect. Now years later and knowing Jesus I realise that was grace. I realise that is how Jesus dealt with people, which is how God loves us, with total forgiveness and grace. Nothing in this world is a better motivator. I only have to think of that day to get things right in my head. I’d still give a lifetime to go back and not have done this and not made my lovely mum cry but I probably wouldn’t have learnt that lesson of love and grace.